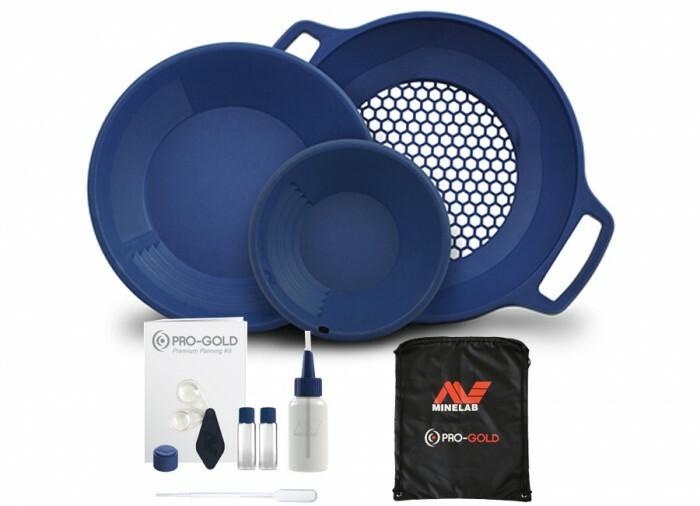 Go on a whole new adventure with Minelab PRO-GOLD Premium Panning Kit! 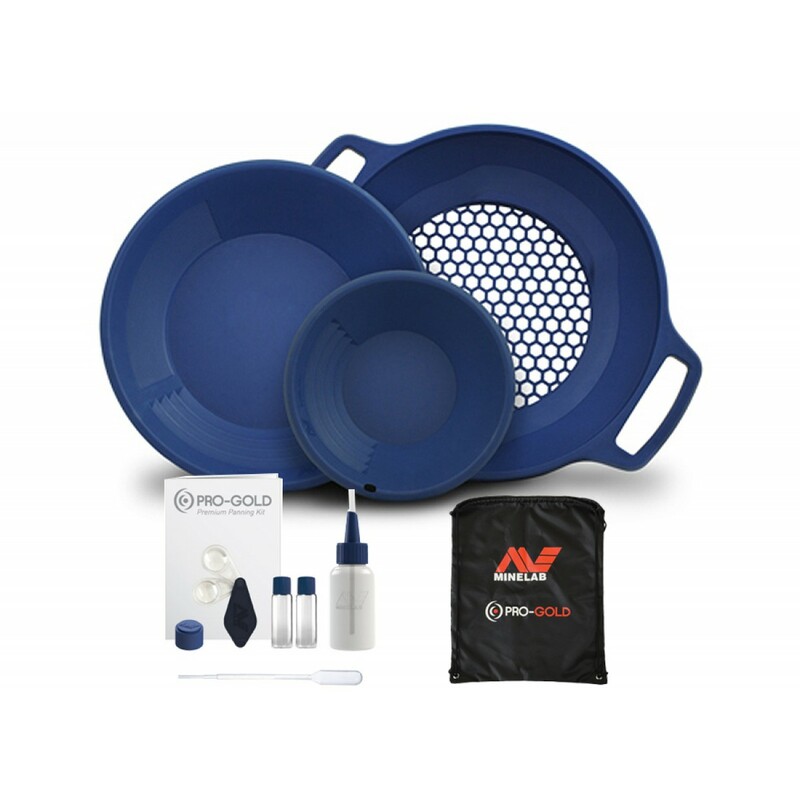 This handy, all-inclusive panning kit includes all you need to become a first-rate gold prospector. 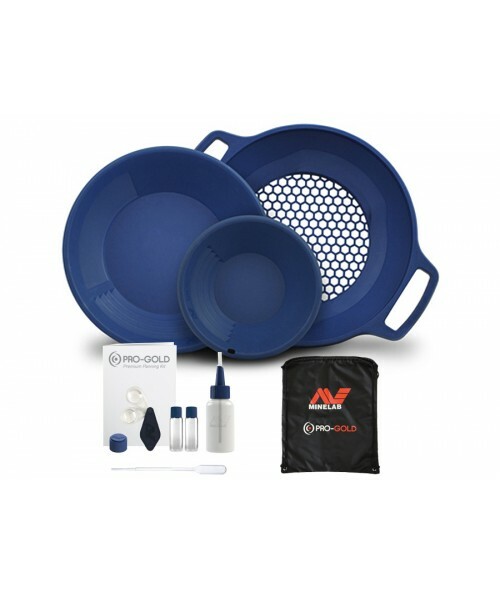 Included in this set are two ultra-durable pans and one versatile classifier for easy prospecting. 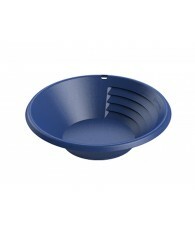 These built-to-last pans are made of a polypropylene material that is UV resistant material and will float in water. This kit also includes a handy Getting Started Guide that will give you step-by-step instructions on the art of panning for gold. 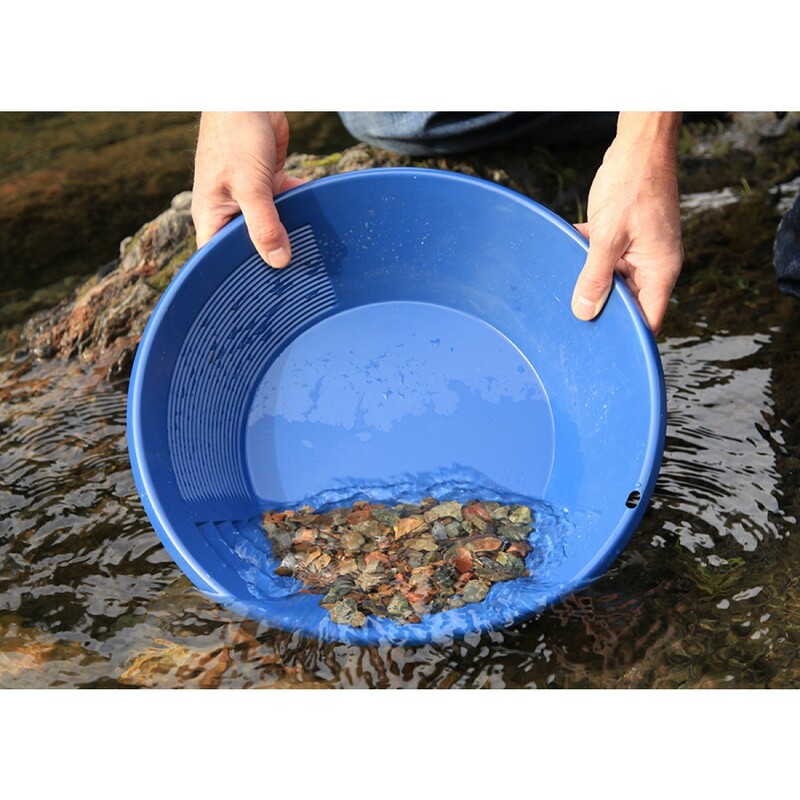 Gold is one of the heaviest elements and therefore can be recovered using just gravity and a gold pan! Material containing rocks, sand, iron and gold particles is agitated to separate the heavy elements (e.g. 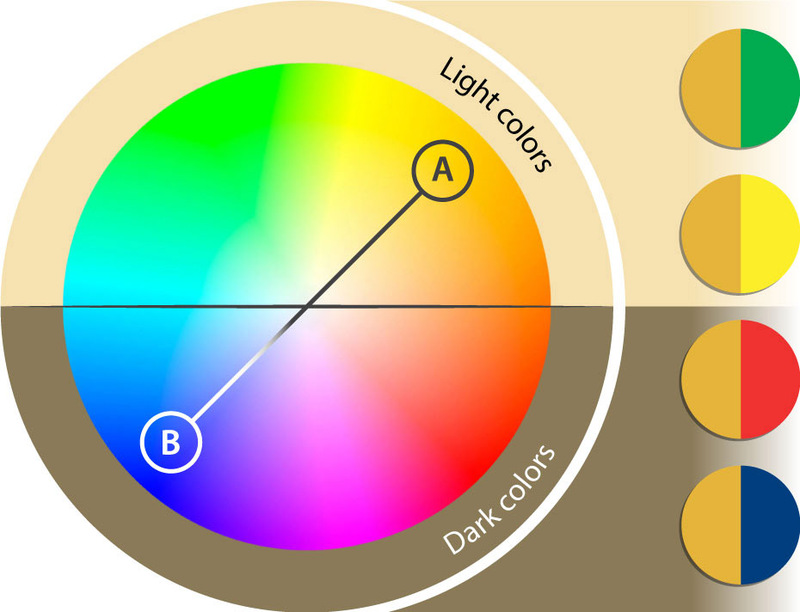 gold and iron) from the lighter material (e.g. light sand, dirt, and rock). During the panning process, the gold essentially ‘falls’ to the bottom of the pan. By taking your time to agitate the material in your pan as much as possible, you can be guaranteed to separate just about all of the gold, which you get to keep! Many countries are rich in alluvial gold, deposited by running water. If you take the time to research an area and find the right location, you will likely have more success. Look for your panning material in rock crevices, and around the bases of rocks and boulders where gold is likely to have become trapped. The key is to dig down as much as possible for your material, since water action has already started the process of moving the gold particles downward through the soil. 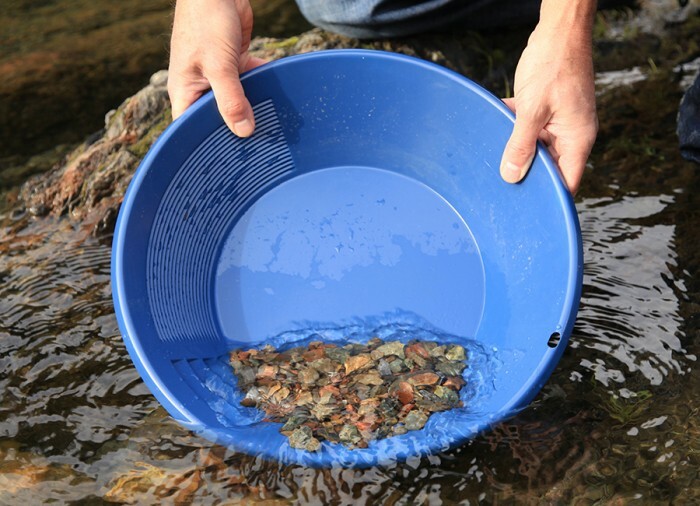 There are two main techniques – wet panning and dry panning. Wet panning requires less skill to master because it creates a liquid suspension of the panning material. This aids the action of gravity, allowing the heavier gold to rapidly collect in the riffles. You can wet pan in any water that is deep enough to submerge your pan and move it around. It’s like having three gold pans in one! There is a standard smooth sidewall, PLUS coarse and fine sidewall riffles (15" pan) to catch all sizes of alluvial gold particles efficiently so you don’t miss any. 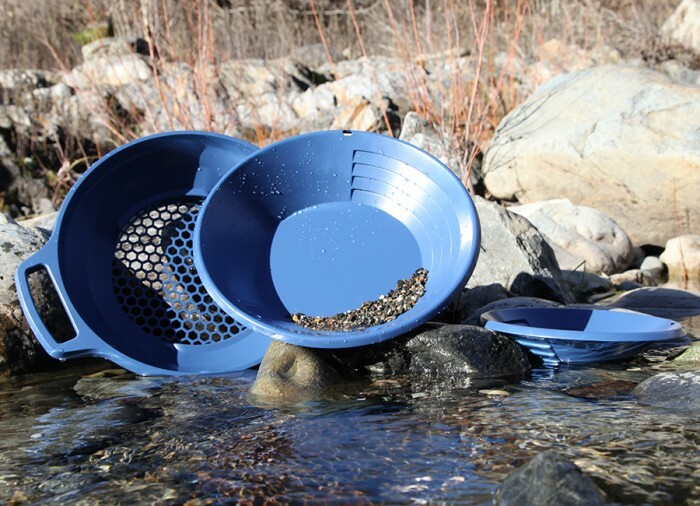 The coarse riffles easily trap the larger gold nuggets to help you quickly discard unwanted gravel, whilst the fine riffles capture the tiny gold specks – this can add up to big gold fast! Large 90° Riffles - Large 90° riffles on the 15" and 10" pans catch larger gold grains before they wash away. This is a good initial step to separate the black sand and gold from lighter colored sediments. 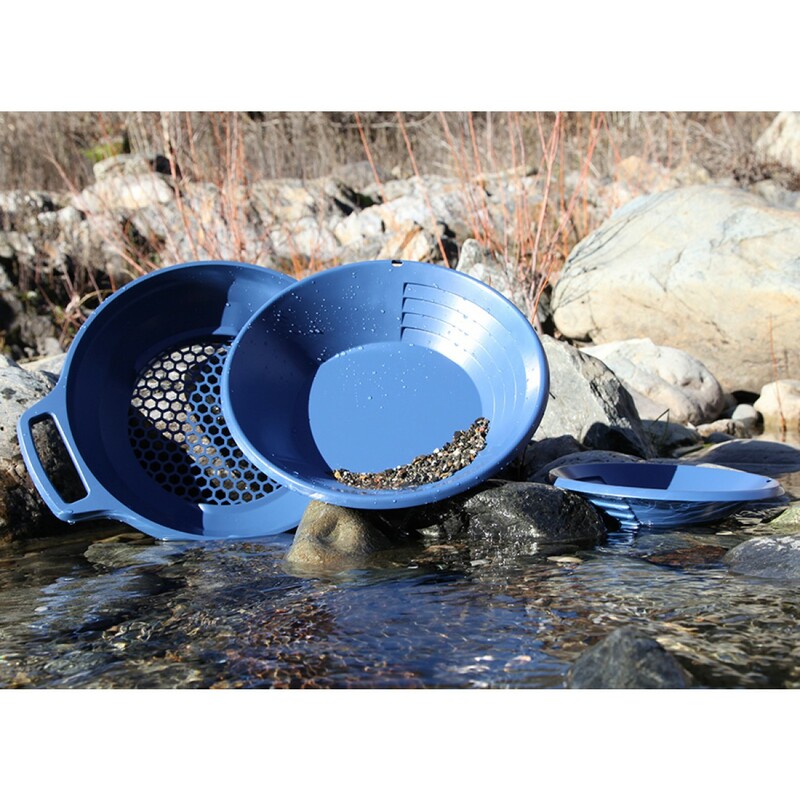 Mini Riffles - Mini riffles on the 15" pan assist in trapping very tiny gold in fine black sand, allowing the sand to wash away leaving the gold behind. Riffles are the graduated grooves in the side of the gold pan that capture gold as water containing sand and sediment flows across them. 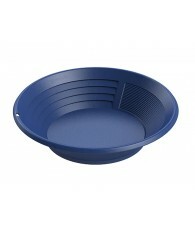 The 15" Pro Gold pan has both coarse and fine riffles. Generally, coarse riffles are for separating larger material, and fine riffles are for separating very small particles. Black sand is made up of alluvial sand consisting predominantly of grains of heavy dark minerals or rocks, and is commonly found with placer (or alluvial) gold. Black sand containing iron particles is magnetic and a good indicator of possible gold deposits nearby. 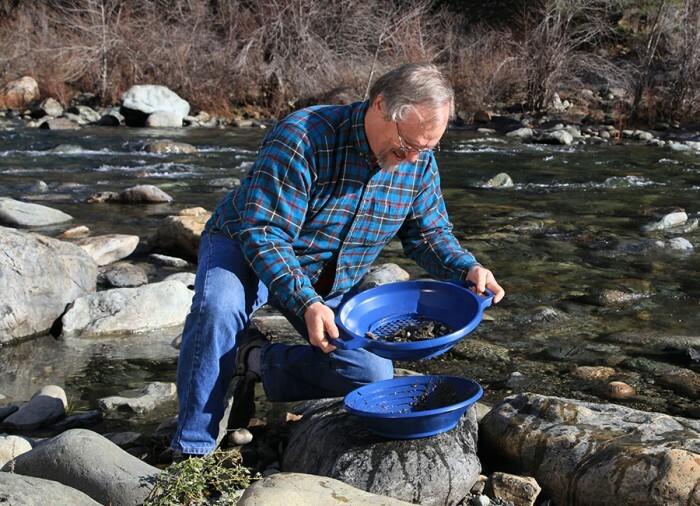 If you want to have a go at practicing your panning technique before you go out looking for gold, you can! Get yourself some small gold nuggets (or small lead pieces) and mix them into some gravel and dirt. Panning for known samples is an excellent way to understand what is happening to your material as you work it, and you will have greater confidence and success when you get out in the field!